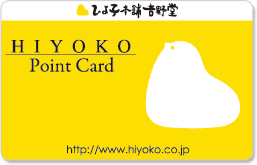 With the Hiyoko Points Card, you can earn points with every purchase. With the exception of our Tokyo location, you can use this card at any Hiyoko Honpo Yoshinodo direct sales store and earn points with each visit. It can be used at most Hiyoko Direct Sales Stores. This card can also be used at Frau Atsuko Kayashina. There are no joining or annual fees. You get 1 point for every 200 yen you spend. You get a 500 yen discount coupon for every 100 points you earn. You get double points after your second visit in a given month for the rest of that month. 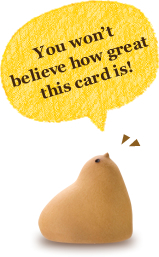 On Hiyoko Days, the 14th and 15th of every month, you earn triple points. Once a year on your birthday, you can receive 20 points. Receive points by subscribing to our e-mail magazine. (In development). This magazine will give you information on the latest point campaigns and new products. Copyright © HIYOKO.co.,ltd. All Rights Reserved.